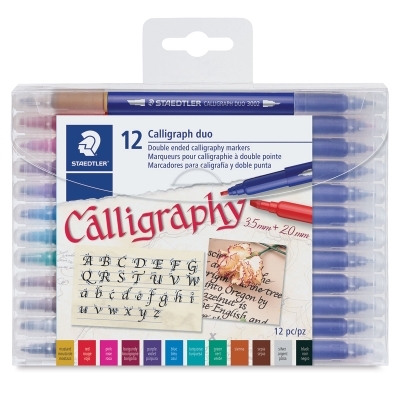 These double-ended calligraphy markers are the easiest, most economical way to create beautiful, hand-lettered greeting cards, letters, certificates, and more. The two chisel points, measuring 2 mm and 3.5 mm wide, are made of flexible fiber, perfect for a variety of writing styles and convenient for both left and right-handed users. 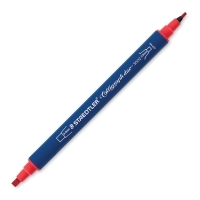 The waterbased pigment ink is fade-resistant and waterproof. Set of 12 — Includes one each of Black, Blue, Burgundy, Green, Mustard, Pink, Purple, Red, Sepia, Sienna, Silver, and Turquoise. 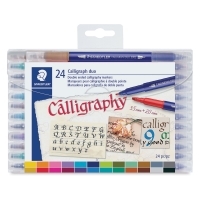 Set of 24 — Includes one each of the Antique Gold, Black, Blue, Blue Grey, Burgundy, Cool Grey, Forest Green, Green, Light Blue, Light Pink, Lime Green, Mauve, Mid Brown, Mustard, Navy Blue, Olive Green, Orange, Pink, Purple, Red, Sepia, Sienna, Turquoise, and Yellow.